Part of what makes a technology trending is the amount of financial investment into that particular niche. Virtual reality (VR) and augmented reality (AR) tech have landed on our top trends list for several years. The expansion of VR/AR applications mirrors the rising amount of capital flowing into software, hardware, and supporting providers working in the field. AR/VR tech is drawing huge quantities of funding across the board. In 2016, the 199 financing deals raised a combined 2 billion dollars. Deals already were up 60% in the first quarter of 2017. Rothenburg Ventures has been a leader in AR/VR technology investments since 2012. Other big players include Boost VC, ViveX, and the Venture Reality Fund. The real estate industry has seriously been influenced from the investments into AR/VR technology. Field leader Matterport is one of the companies backed by Rothenberg Ventures and offers virtual tours of existing spaces plus one the largest accessible VR libraries. AR Pandora is offering cutting-edge AR presentations for CRE professionals using their mobile devices while iStaging helps agents show clients the potential of unfinished spaces. 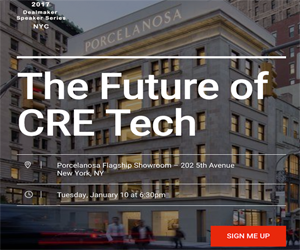 CRE leader CBRE recently acquired virtual services startup Floored to give its professionals advantages in marketing and configuring spaces. Lately, augmented reality shows signs of gaining steam, both with capital investment and in general interest in AR applications for commercial real estate. AR technology accounted for 22% of the investment deals made during the first five months of the year, according to CB Insights. As of May 2017, 25 new financing deals were for AR companies. Startups that offer both VR and AR applications represented 31 deals, compared to 60 VR-only companies. The CRE industry can expect continued capital backing AR/VR startups, inside and outside the industry. AR especially has the potential to change how real estate professionals present unfinished spaces to their clients. Imagine the impact of presenting a space with the client’s branding and logo in place.